So I decided to share some of the bits and pieces of myself with all of you. bringing my “Dust Bunnies of the Soul” out into the light before they bite me … again. Well, I have a photo and another piece to share this time. I’ve written about being an androgyne and what that means so I won’t rehash that. 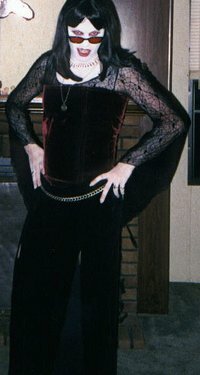 Once upon a time I decided to dress up as a vampire for Halloween. But I didn’t stop there, oh no. I decided that I was going to dress up as a woman dressing up as a vampire. I even went as far as having a corset custom made for me. I figured that Halloween would be the safest time for me to let this particular bit of me out and about. I then decided to go out on the town. I met up with a couple friends who I recruited as bodyguards for the night. I went down to a local club and when I got outside I wound up being hit on by one of my best friends. Can you say awkward? When your BIG BIKER best friend hits on you all you can do is pray that he has a good sense of humour. Luckily for me, he not only had enough of a sense of humor to not kill me, he got in on the fun. Suffice to say that I went home with a stack of phone numbers and never once had to pay for a drink. THIS is Selene DuVessa, the selene part of dracoselene, and she is a Halloween Heartstopper. She likes her chrome plated fangs and her blood red shades. She wears stockings and thinks pantyhose are ICK. When she gets out of the house, she tends to speak in a clipped british/southern accent, and she looks MUCH better in person than in a photo. I wish I had better/newer photos but frankly I’m normally having too much fun to remember. I haven’t done this in a while, but she is never far from the front of my mind. So have I run off any of you with this piece of me? Or are you chomping at the bit to see what else I have hidden in the toybox of my soul?